Activists who oppose the Mountain Valley Pipeline are living in the Jefferson National Forest, hoping to delay the project. Two tree sitters have been on Peters Mountain in West Virginia for more than a month. And one woman has been living on a monopod, in a section of forest where pipeline construction is slated to take place. On March 31st, Forest Service officials closed an access road making it impossible for supporters to deliver food and water to her. A group of nine anonymous protest supporters hiked a rugged trail next to Pocahontas Road because the road and a 400-foot corridor are off limits. They carried food and water with them, hoping Forest Service law enforcement officials, who've been stationed there 24 hours a day, would allow them to drop off the supplies. The officials did not want to be identified.
" You guys were told at the bottom, that the road is closed to foot traffic.” said an unidentified Forest Service Official. Breathing heavily, an unidentified protest supporter said, " We didn't come up here until right now." The official replied, "Well that doesn't matter the road is closed. OK?" A woman's voice said, "OK." Then she asked, "Is there someone we could talk to?" "You're talking to him," said the official. "Do want to step over (here)?" She inquired. He replied, "Well, what's done is done, but I'll tell you what we can do is, you can either receive citations --everybody---or you can turn around and go back." The supporters did not get citations, but they were given warnings. They’re concerned about the monopod sitter’s health if she is not allowed to receive supplies. 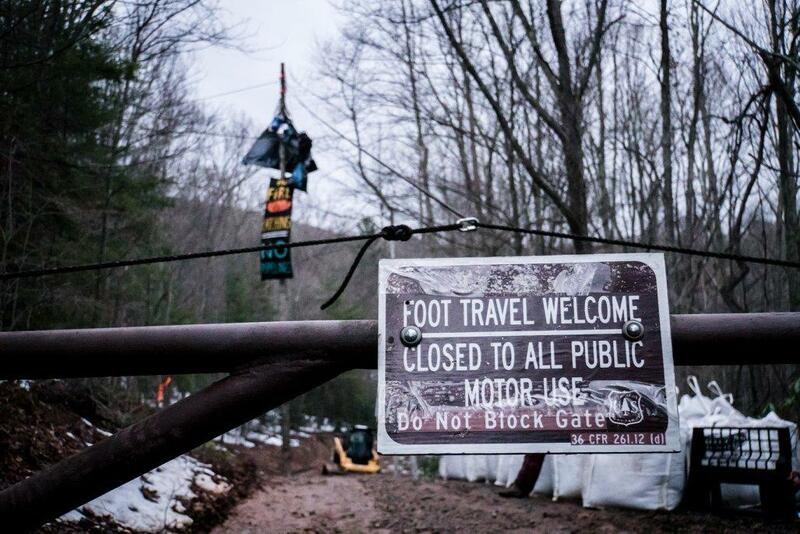 Forrest Service officials say, if she is in danger, she should end her protest action. Last month, a West Virginia Judge denied an injunction filed by MVP to remove the tree sitters in West Virginia, saying the construction delay their protest is causing would do the company no irreparable harm. According to the group, "Appalachians Against Pipelines," officials did not allow the supporters to give supplies to the protester in the pod, but did allow them to leave the food and water with other supporters, camped in the forest nearby. It is not known if she received it.